In 1510, when the Cape of Good Hope was still revered as the Portal to the Indies, the Viceroy of Portuguese India was led ashore, attacked, slain and hurriedly buried in a shallow grave. The murder of Dom Francisco d'Almeida remains a mystery to this day. Was it the fulfilment of a prophecy or an act of poetic justice? Was it an ambush, a mutiny or even an assassination? If so, was it instigated by the King of Portugal or the Church of Rome? 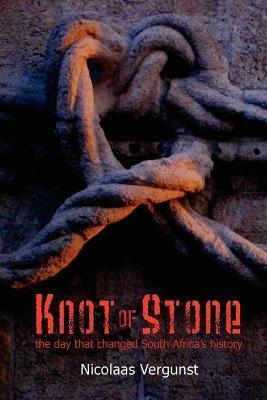 Knot of Stone is a tale of historical detection in which two unlikely travel companions - a restless Dutch historian, Sonja Haas, and a jaded Afrikaans archaeologist, Jason Tomas - find themselves drawn together after discovering a five-century-old skeleton at the foot of Table Mountain. Their search for new evidence leads the reader ever further north to ancestral burial sites, remote mountain sanctuaries, sacred springs, medieval monasteries and rare museum artefacts. Via various roadside encounters, including the startling revelations of a sangoma (a healer empowered by the ancestors), they reconstruct the past and their own identities, with divergent consequences. The multi-layered story is ultimately a tale of self-discovery. Born in Cape Town of emigrant Dutch parents, Nicolaas Vergunst (1958) has been an artist, teacher, designer, curator and journalist. After a longstanding career with the national museums of South Africa, he resigned to write this novel and has since lived with his wife, Ellen, a diplomat and historian, in Kiev, Kinshasa and Strasbourg. They have a house in Leiden where eventually, they wish to retire with their intrepid cats.